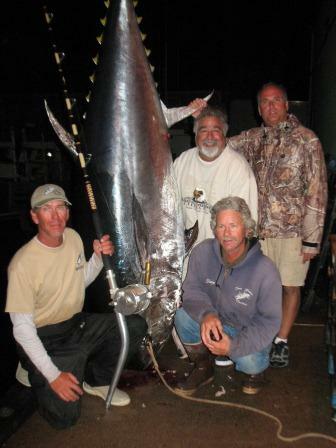 Tuna Hunter led the crew from Cajun Tide Beach Resort in Grand Ilse LA into 700lb giant bluefin tuna on a recent Gloucester fishing charter. It was a great fishing day, and a great fishing night. The morning started out a typical tuna charter – catch some mackerel, sail out to Stellwagen, put up the kite for a day of tuna kite fishing. Soon – hooked up! 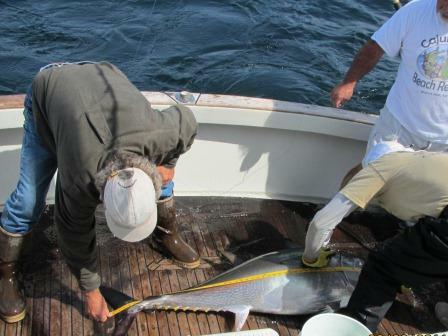 Fred fought this bluefin tuna to the boat. All agreed to tag and release this 61 inch in favor of a giant later in the day. Who knew! 2:45PM the rod went off, this time Mark took the reel … over 6 hours later, yup. 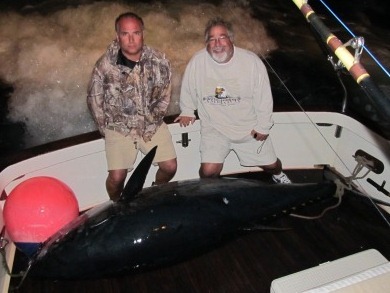 after 9PM, the crew hauled this 700lb bluefin through the fish door. Congratulations to angler Mark for a battle well fought. No doubt this fish was landed largely due to Mark’s skill and perseverance, and right moves by all aboard throughout the fight. We look forward to fishing with the Cajun Tide crew again!